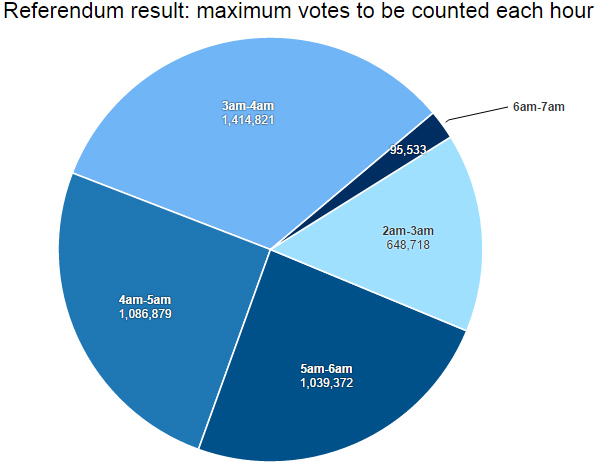 Although the votes cast in Thursday’s referendum are being collated and counted at 32 separate locations, it’s important to remember the final result is the sum of all votes across Scotland. The outcome is not based on one side prevailing in a majority of the 32 counts. It is entirely possible for Yes or No to win the referendum without notching up most number of regional wins. The only threshold that matters will be winning a majority of the entire Scottish electorate – half the total votes cast plus one, to be blunt. As the night goes on we will see running totals for the Yes and No campaigns. These will rise and fall according to which regions have reported. It will be entirely possible for one side to take a lead early on, only to lose it an hour or so later, then regain it again, and so on. Bear in mind those totals are based on a 100% turnout and are necessarily an over-estimate. But you can see that there’s a pretty even spread from 3am-6am – despite only three declarations scheduled for 5am-6am (Glasgow, Edinburgh and Aberdeen). The main point I’m trying to make is: beware early trends. 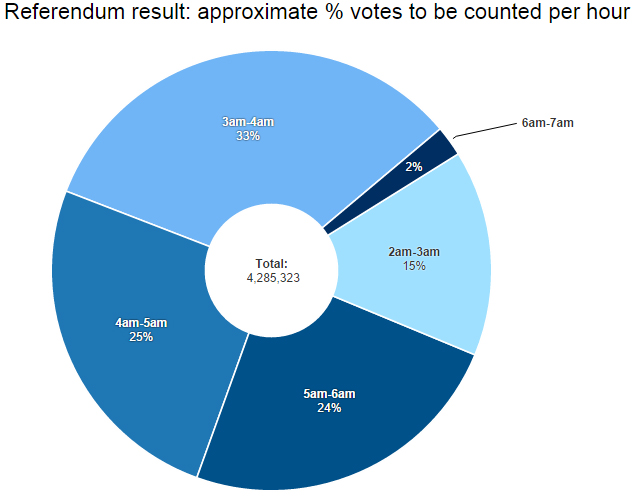 What looks like a surge for Yes early in the night may subside by breakfast time – and vice versa. So, stay up all night? I’ve not done that since 1997 (actually, I admit it, I went to sleep after Portillo lost Enfield South at roughly 3am). Or go to bed early and get up at 5am or 6am? Alex Salmond expects a ‘record turnout’, but what’s the figure to beat?